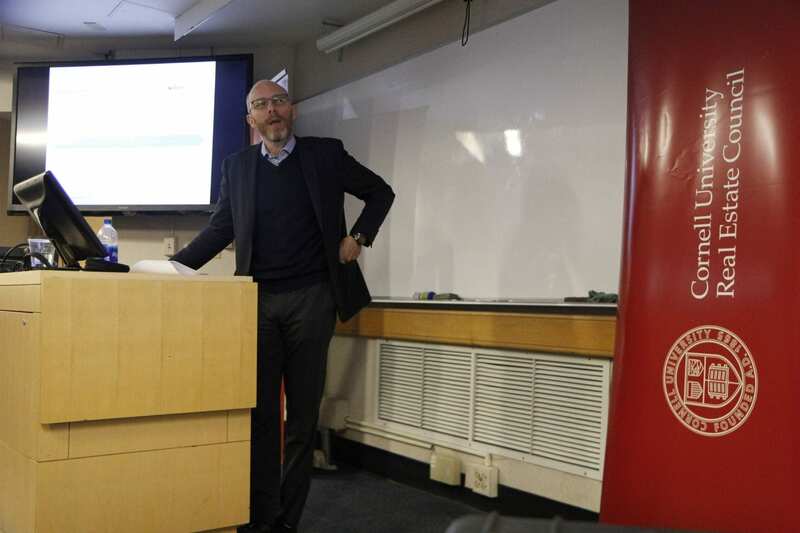 This past Thursday the Baker Program in Real Estate had the pleasure of welcoming Cornell alumnus Alan Riffkin (CALS ’88) of Lazard, a global leader in merger and acquisition (M&A) advisory services. Alan is a managing director of the real estate M&A group, a dynamic team that provides advisory services to a wide variety of companies in and around the world of real estate. Over the course of his thirty-year career, real estate has evolved from a business virtually ignored by institutional investors into an individually recognized sector of the S&P 500. 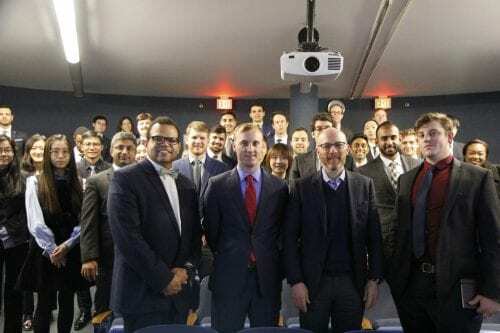 Over the course of the session Alan offered broad insight into the world of investment banking and gave students an in-depth view of current trends and strategic themes underlying the real estate investment management landscape. Never having any intention to pursue real estate as a career, Alan did not take any real estate classes or work in real estate during his time at Cornell. Graduating in 1988 in the wake of the infamous 1987 Black Monday stock market crash, however, led him to a role as an associate in Citi’s Commercial Real Estate Group, where he developed an affinity for the business. The credit crisis of the early 90s brought him to Goldman Sachs, where he was able to participate in a market that saw consolidation and the formation of some of the first publicly traded real estate companies, such as General Growth Properties (now known as Brookfield Properties – one of the largest owners of shopping centers in the United States) and Boston Properties. In 2003, he joined Lazard to focus exclusively on real estate M&A and has been there ever since working on some of the largest transactions with several of the top companies of the industry. In terms of current market trends, Alan pointed specifically to the importance of real estate being established in 2016 as in individual sector of the S&P 500, joining the likes of energy, materials, and industrials. Once only a sub-category of the financials sector, the inclusion of real estate investment trusts (REITs) and real estate management and development firms into this new category has allowed billions of dollars of new equity to be poured into the industry as institutional investors now recognize real estate as a crucially important part of their strategies. The increased scrutiny that comes with access to public markets has increased volatility as investors seek to understand what can often be a complex mix of assets. Public investors seek simplicity, often pushing portfolios from a combination of asset types (such as office, industrial, and multi-family) into single assets in order to promote efficiency and develop core competencies. This leads to friction as newly formed public entities seek to divest particular portions of their portfolios, whether to other publicly traded investment companies or in the private market. The structural changes in how real estate is perceived as an asset class have come alongside fundamental changes in the industry. Alan highlighted many familiar challenges facing investors, such as the shift in retail away from large shopping malls in response to the growing world of e-commerce and the under-valuation of the office market as stakeholders evaluate the threat of co-working spaces. It is precisely in these areas that Alan and his team provide their strategic advisory services. Companies grapple with finding the most economically efficient and beneficial structure as they bring together massive groups of assets and their various administrative and portfolio components. Lazard has developed a formidable reputation in the industry for providing neutral opinions that take into account an unbiased view of the risks, rewards, and potential outcomes of a particular merger or acquisition. This presence and trust in the market stems from Lazard’s primary focus on M&A advisory relative to the other service providers. M&A advisory makes up 55% of Lazard’s revenue – far more than its competitors such as Morgan Stanley or Goldman Sachs, whose groups typically only account for a fraction (less than 5-10%) of firm revenue. Alan wrapped up the session by walking Baker students through one of his most recent transactions – the historic $13 billion merger of Marriott and Starwood. The transaction created the world’s largest hotel company, including more than 1.1 million rooms across 5,800 properties in more than 110 countries. Lazard, representing Starwood, led the process from the beginning. Alan was able to give Bakers an inside view of the board of directors’ decision to put the company on the market and walked through the high stakes negotiations that took place, including a last minute all-cash offer from Chinese insurance giant Anbang. The case was an incredibly insightful look into the various factors that influence high-level decisions as an increasingly global real estate marketplace continues to mature. The Baker Program would like to extend a heartfelt thanks to Alan for taking time to visit with the program and share his experiences over the course of a long and successful career.